Throughout its history, Jeep has stood for toughness and versatility – in more ways than one. The Jeep brand has survived numerous changes of ownership. It has created new markets when existing ones dried up. And it goes almost without saying that the vehicle itself has changed – a lot – as times have changed. The first Jeep went into production in 1941, and Jeeps distinguished themselves throughout World War II. When the war ended, Jeep needed a new market niche and found one as a civilian utility vehicle, primarily for agriculture. Jeep survived several ownership changes – first Willys-Overland, then Kaiser, than American Motors, which sold out in 1987 to Chrysler. But a more interesting measure of just how far Jeep has come is to contract the 1995 Grand Cherokee Limited with the World War II edition. They couldn’t be further apart. The saying goes that imitation is the best form of flattery, and nowhere is that more apropos than in the auto industry. The new ’95 Chevrolet Blazer/GMC Jimmy and the ’95 Ford Explorer now feature flowing lines in the same vein as the Grand Cherokee. But when the Grand Cherokee Limited made its debut back in 1992 wearing its smooth new civilian clothing, Jeep competitors and critics accused the old soldier of going soft. They said the Grand Cherokee didn’t have the brutish look Jeeps have been known for throughout their more than 50-year history. Well, maybe it doesn’t. But the design formula obviously worked, and others have since followed. One area where the competition hasn’t followed is beneath the sheetmetal. Most sport/utilities are body-on-frame designs. The frame is fabricated in one part of the factory and the bodywork is assembled in another. They don’t meet until the late stages of the assembly process when the finished body is bolted to the frame. Like its Cherokee progenitor, the Grand Cherokee takes a different approach. It’s a unit-body design, which means the body and the chassis are all one piece. This is pretty much the standard approach in today’s passenger cars, but it’s unusual in sport/utility vehicles. Conventional wisdom says that body-on-frame construction is inherently more rugged, which helps it stand up to rough duty better than unit-body vehicles. The advantage of unit-body designs is weight-savings, which improves handling, performance and fuel economy. Which concept makes more sense? That’s up to you. We can only say that the Cherokee and Grand Cherokee have done their share of rough stuff without falling apart, and that Jeep knows its business when it comes to durability. Construction issues aside, there’s no question that the Grand Cherokee Limited is as handsome and sophisticated as sport/utility vehicles get. Available for ’95 in three trim levels – the basic SE, Laredo and Limited – and a new Orvis Edition (Jeep’s answer to Ford’s Eddie Bauer packages), the Grand Cherokee is a suburban status symbol. It’s just as much at home at the country club as it is at the hunting lodge. Maybe more so. The Grand Cherokee is not as tall as other sport/utilities. That makes it easy to board for small children or women in straight skirts. Inside, our Grand Cherokee Limited tester appeared more suited to affluent moms delivering their pride-and-joys to Little League practice than for he-man off-roaders. It’s adorned with an elegant wood-paneled dash and plush leather seats. The automatic climate control system is extremely effective in maintaining a constant, comfortable temperature. The audio system, which is available with a CD player, is the Infinity Gold 120 Watt Power-Amplifier. Transmission and 4-wheel-drive controls are mounted on the floor in front of the console, next to the parking brake and dual cupholders that are big enough for Slurpees. The armrest opens up into a storage area. Power window controls and power door locks are located on the upper front quarter of the driver” door. Puddle lamps under the doors’ armrests illuminate your step as you hop out of the vehicle. Cruise control buttons are located on the steering wheel below the standard driver’s airbag. There’s no passenger airbag – the new Land Rover Discovery leads in this passive safety department – but there are side impact door beams. The Grand Cherokee Limited seats five – four comfortably – and accommodates a relatively small amount of luggage. The front seats are buckets; the rear seat is a 60/40 split bench. An integrated child safety seat is optional, as are removable rear headrests. A sunroof is also optional. The Grand Cherokee Limited has less cargo capacity than its Ford and Chevy competitors. The spare tire, stowed in the rear storage compartment, cuts into the cargo space even more. The rear hatch is a one-piece liftgate. We found the liftgate difficult for short folks to reach and close. With the hefty price tag of the Grand Cherokee Limited, one would think Chrysler could afford to install a handy pull-down strap. In mid-year 1995, a two-piece liftgate with flip-up glass will be available. The Grand Cherokee Limited is available as 2WD or 4WD. All Grand Cherokee models offer a selection of three transfer cases; the Command-Trac system allows drivers to switch from normal 2WD to part-time 4WD for off-road use or when weather conditions command; the Select-Trac system has all the features of the Command-Trac plus a full-time 4WD mode; and the Quadra-Trac all-time 4WD system automatically adjusts to changing road conditions. The tested model was equipped with the full-time 4WD system, providing four-season confidence with a virtually invisible system. Off-road, the full-time system has a viscous center differential that locks up only when extra traction is required by spinning wheels. Although Land Rover 4WD systems and suspensions setups have a small edge in off-road performance, the Jeep Quadra-Trac system is about the best all-around system of its kind in this price range. All Grand Cherokees also are available with a choice of two engines. The standard engine is a 4.0-liter, in-line 6-cylinder with fuel injection. It produces 190 hp and 225 lb.-ft. of torque. The tested model was equipped with the optional 5.2-liter V8 that has been improved for 1995 with a new camshaft. The Grand Cherokee Limited is one of two compact sport/utilities offering a V8 engine. The smooth-revving V8 provides 220 hp at 4400 rpm and 300 lb.-ft. at 3200 rpm. We enjoyed the low throaty rumble from under the hood; otherwise the ride was quiet. We also enjoyed the way its V8 engine hustled it down the road. With V8 power, the Grand Cherokee’s acceleration is best in class. Our major complaint with this vehicle was its vague steering. We also experienced some body roll on wide curves at highway speeds. 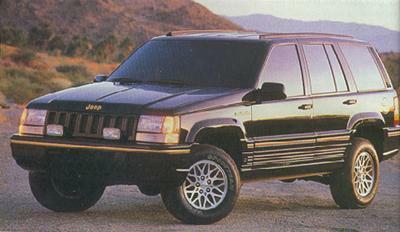 New for ’95, all grand Cherokee models are equipped with 4-wheel disc brakes. Previously, these brakes were available only on the Limited version.. Anti-lock brakes are standard, which is a Grand Cherokee plus. The Grand Cherokee Limited rates as one of the most luxurious sport/utilities on the market, and rates high marks for versatility, too. It strikes the right balance between on-road manners and off-road ruggedness. Engines: 5.2-liter V8¾ 220 hp, 300 lb.-ft.
Length/width/height: 179.0 / 70.9 / 64.7 in. Head/hip/leg room, f: 38.9 / 57.8 / 40.9 in.